The Staircase: Last Chance debuts tonight on Sundance at 10 p.m. Eastern. In December of 2001, Kathleen Peterson died in a bloody, grisly scene at the bottom of a staircase in her North Carolina home. Her husband, writer Michael Peterson, was charged with first-degree murder, accused of beating her to death with a blunt object. He denied having anything to do with her death, and the trial that followed—one of the longest in North Carolina history—was documented by French filmmaker Jean-Xavier de Lestrade in the epic, gripping 2004 eight-part docu-series The Staircase. There’s no way to go any further about the series’ two new chapters, The Staircase: Last Chance, without revealing the end of the original, so if you’re inclined to spend six hours catching up, do so before heading to the next paragraph. What made the Peterson trial so fascinating—and the Staircase film so edge-of-the-seat—was the incredible difficulty in parsing the evidence. Peterson’s guilt or innocence was never clear, and there was powerful evidence on both sides of the courtroom. Kathleen Peterson suffered horrible injuries that seemed inconsistent with a fall down the stairs, but there was no murder weapon found. And beyond that, Michael Peterson just didn’t seem capable of murder. Sure, he’s a pretty weird guy—and it sure didn’t help in North Carolina that he was trawling for gay lovers on the Internet—but something didn’t quite add up. At the end of The Staircase, it certainly wasn’t obvious which way the jury was going to go. And (final spoiler alert, people) they found him guilty of first-degree murder, and Peterson was sentenced in 2003 to life without parole. His family—all of whom stuck by him except his stepdaughter—was devastated, and his legal team began various appeals. 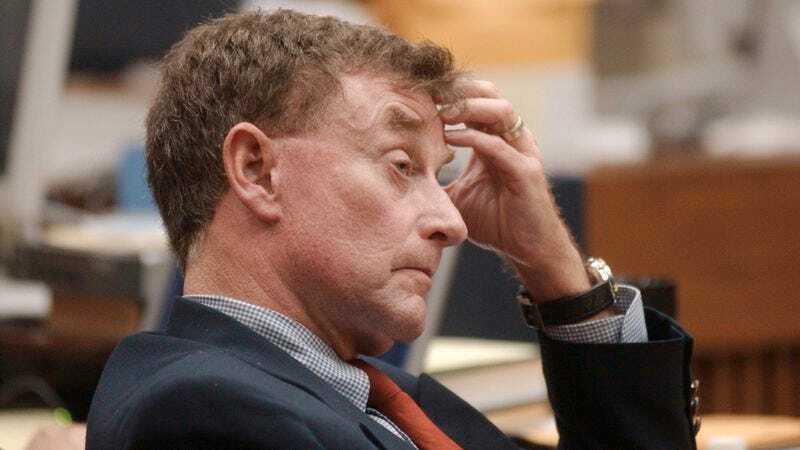 The Staircase: Last Chance, which airs half tonight and half next Monday, March 11, jumps back into the case in 2010, with the titular “last chance” hearing looming. The first hour does a solid job of catching viewers up on the details of the original trial, including the introduction of an earlier “victim” (or was it simply a horrible coincidence?) and the blood-spatter evidence presented at the original trial. It’s horrifying, fascinating stuff, and a solid refresher for those who’ve seen the earlier documentary, too. There’s lots of Peterson family time here, too—more than in those original documentaries, and it reveals more of a bias on the filmmaker’s part than The Staircase did. (In my mind, the guys behind the camera are solidly convinced of Peterson’s innocence, or at the very least not convinced of his guilt beyond a reasonable doubt.) But the second hour of Last Chance focuses on the actual hearing, in which Peterson and his lawyer are seeking a new trial. Without getting into the most spoiler-y territory, Last Chance sets up a new villain, and portrays him—Duane Deaver, an investigator whose testimony at the first trial pretty much damned Peterson—unabashedly as one. It’s a fascinating trip into the legal system, and a scary one for a variety of reasons. The cameras pretty much stay out of the way, as they should here, letting the bizarre circumstances of this horrible situation play out. Now stop reading if you’re going to watch. NOW, LET’S DISCUSS THE “OWL THEORY”: Perhaps in an effort not to confuse the issue, Last Chance doesn’t bring up the “owl theory” about Kathleen Peterson’s death, which perhaps deserves a whole documentary of its own. In short: Some evidence suggests that her wounds may have been caused by a huge owl attacking her, after which she ran inside the house, slipped on the stairs causing more injury, and died. What’s remarkable about this trial is that a possible owl attack might not even be the weirdest thing happening.